The Department of Veterans Affairs is making efforts to improve its construction management and align its design guidelines to industry standards. The 95,000-sf VA San Jose Community-Based Outpatient Clinic, which opens officially this fall, has a modular floor plan that separates patient and staff corridors to create a more tranquil environment. Photo: Hoefer Wysocki. 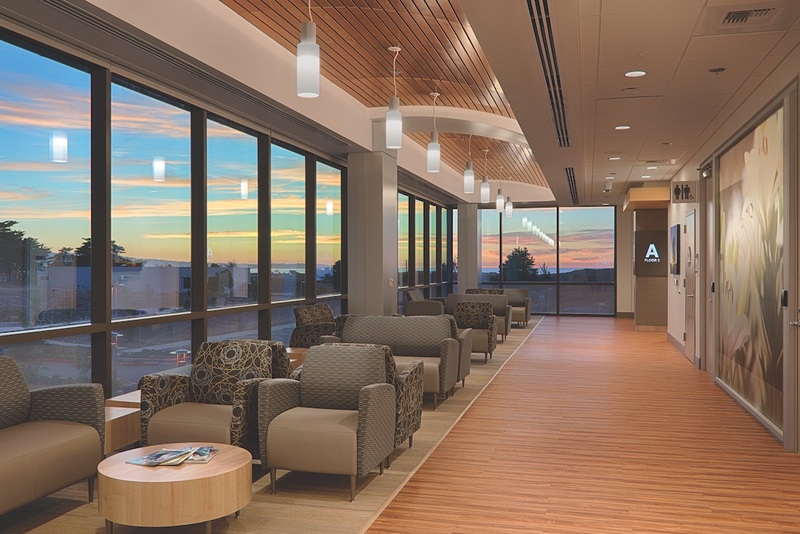 This fall, the Department of Veterans Affairs’ Palo Alto Health Care System in California is opening a three-story, 95,000-sf Community-Based Outpatient Clinic (CBOC) in the scenic Silver Creek section of San Jose. The new clinic—which will replace a 65,000-sf, single-story facility that opened 22 years ago—features design, operational, and service elements that define the VA’s recent approaches to veterans’ care and staff management. The department’s Veterans Health Administration (VHA) provides care for nine million enrolled veterans each year at 1,243 healthcare facilities in the U.S., including 172 VA hospitals and 1,062 outpatient clinics. CBOCs, which are built by private developers and leased to the VA for 20 years, currently account for the greater portion of the VA’s recent expansion. Stella Fiotes, AIA, Executive Director of the VA’s Office of Construction and Facilities Management (VAOCFM), tells BD+C that, by year’s end, the VA would award 16 CBOC leases and release solicitations for 10 more. She adds that, aside from CBOCs, the VA is focusing on expanding its existing medical campuses with specialized care centers, such as the SmithGroup-designed 174,000-sf Polytrauma and Blind Rehabilitation Center in Palo Alto, Calif., which is scheduled open this fall; and the four-floor, $148.6 million, 245,000-sf Bed Tower at the James A. Haley Veterans’ Hospital in Tampa, Fla., which just broke ground and should be ready for patients in 2021. Page is the tower’s designer; Turner Construction the general contractor. Respite is a critical design criterion in VA medical facilities. 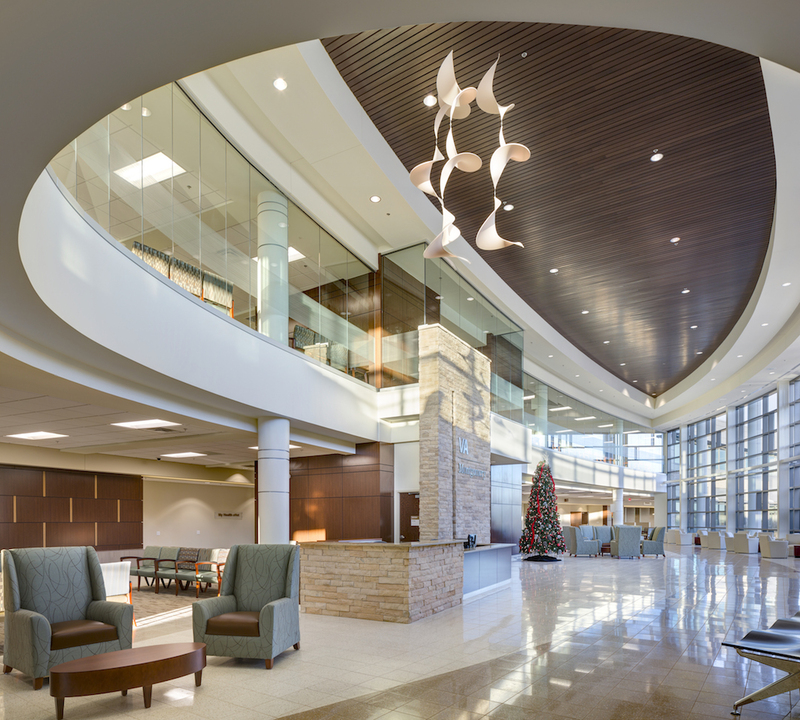 Hoefer Wysocki’s design of the two-story, 154,000-sf VA Health Care Center, on 35 acres in Montgomery, Ala., is a fusion of architecture and landscape. The building is shaped to “embrace” its outdoor environment. The interior design emphasizes daylight and views that maximize the building’s exposure to nature. A warm palette includes natural stone and wood ceilings. Photo: Hoefer Wysocki. Over the last two decades, the VA has been trying to evolve from being a hospital-driven healthcare system to an integrated delivery system that emphasizes a full continuum of care. The proliferation of CBOCs has led the VA to rethink whether its notoriously rigid design guidelines for medical centers could be loosened a bit. Fiotes has asked her staff to review those guidelines to see which might be brought closer in line with AEC industry standards. The VA is also leading the way in sustainable design, pursuing LEED certification more frequently than the private sector, says Hosam Habib, AIA, Principal and Director of Design with Hoefer Wysocki, an architectural firm with offices in Leawood, Kan., and Dallas that has worked with the VA for 30 years, and whose recent projects include the new San Jose clinic. But the department’s sprawling healthcare portfolio—the largest integrated system in the U.S.—is still saddled with many older facilities that don’t conform to its current operational model. The projects that the VA listed in its 2018 budget request to Congress would cost anywhere from $55 billion and $67 billion to build or upgrade and activate. The $3 billion to $4 billion that Congress appropriates annually to the department for construction, renovation, repair, and nonrecurring maintenance hardly comes close to the VA’s budgetary needs. To supplement what Congress doles out, the VA has been exploring funding options that include private-sector investment. Abetting this exploration was the passage, in 2016, of the Communities Helping Invest through Property and Improvements Needed for Veterans Act, better known as CHIP IN, which allows the VA to accept dollar donations and in-kind gifts, like land or buildings, for certain medical facilities. The first pilot project authorized under CHIP IN is a 57,000-sf, $86 million Ambulatory Care Center under construction in Omaha, Neb. Heritage Services, a local philanthropic group that works with civic and business organizations, donated $30 million and is serving as the project’s CM. Since its 2014 budget cycle, the VA has made a number of improvements in its construction management, says Fiotes. 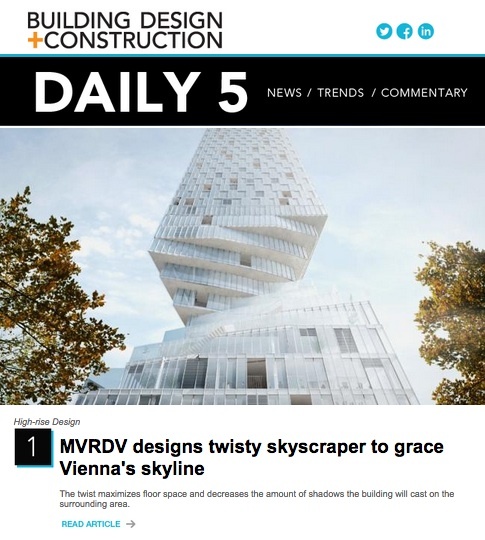 For one thing, it now focuses on making sure that a project’s scope and requirements are clearly defined before design and construction start, which Fiotes concedes hasn’t always been the case. VA will not seek Congressional authorization for any project until at least 35% of its design is completed. At key project milestones, either she or the VA’s deputy secretary must sign off on any major changes. “We’ve gotten good at saying no,” she says. 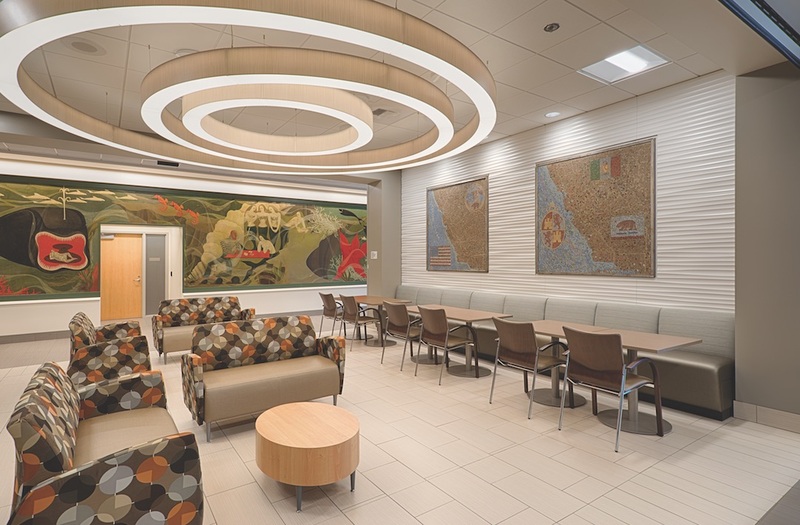 The 150,000-sf Gen. William H. Gourley VA-DOD Clinic in Marina, Calif., features waiting areas for patients and families that look more like a hotel than a hospital. The team for this LEED Gold facility: The Hamstra Group (developer), NMR Architects + Engineers, and Otto Construction (GC). Photo: Tim Maloney/Technical Imagery. AEC sources whose firms have worked extensively with her office say that, on certain projects, the VA has been sharing construction management responsibilities with outside firms or organizations. “We’re seeing more construction administration being performed by AE firms,” says Mike Beezley, PE, President of Apogee Consulting Group, a Cary, N.C.–based architecture and engineering firm that, over the past decade, has worked on around 280 VA projects. Beezley’s observation isn’t surprisingly, given that the VA for decades has been defending itself against accusations that its managerial oversight left much to be desired. Its deficiencies came to a head in Aurora, Colo., where the Rocky Mountain Regional VA Medical Center at the Anschutz Medical Campus, which officially opened on August 11, took nine years to complete at a cost of $1.7 billion—$1.1 billion over budget. The U.S. Army Corps of Engineers, in coordination with the VA, assumed construction management of that project in 2015 and brought in Kiewit-Turner as its GC. The Aurora facility was one of 12 VA projects that the Army Corps took over following the passage, in September 2015, of the Department of Veterans Affairs Expiring Authorities Act, which mandates that construction management of VA projects over $100 million be handed over to a non-VA entity. The VAOCFM doesn’t have the same checks and balances as the Department of Defense or "the Army Corps", according to Shea De Lutis, Director of Market Sector and Project Development for Clark Construction, and Barbara Wagner, Clark’s Senior Vice President. The VA still manages construction for projects budgeted under $100 million, the range for most CBOCs. The General Services Administration, which manages leases for the VA, might assign a delegation to a project, “but we are still in charge of procurement and building,” says Fiotes. Doubts about the VA’s project management acumen notwithstanding, Clark’s executives say their firm has had mostly successful experiences working with the department. These include the Veterans Puget Sound Health Care System’s 204,000-sf, $108 million Mental Health & Research Facility in Seattle, which was completed last year; and the Southeast Louisiana Veteran Health Care System’s 1.7 million-sf, $937 million replacement hospital in New Orleans, completed in 2016. SmithGroup has been involved in at least 125 VA projects over the years. These include the Robley Rex Replacement Medical Center in Louisville, Ky., currently in its construction drawing stage. It is being planned for one million sf of inpatient and outpatient services and could begin construction next year, says architect Philip Tobey, FAIA, FACHA, ASHE, a Senior Vice President in SmithGroup’s Washington, D.C., office and an Editorial Advisor to BD+C. Tobey, who once served as an officer with the U.S. Air Force’s Office of Surgeon General, says there’s a lot to consider when designing VA medical centers, especially those that deal with patients with traumatic injuries. “It’s always about finding respite,” he says. Wherever possible, SmithGroup incorporates nature into its design, such as natural light and courtyards. He adds that “clarity of wayfinding” is critical in these facilities, where patients may have cognitive difficulties. 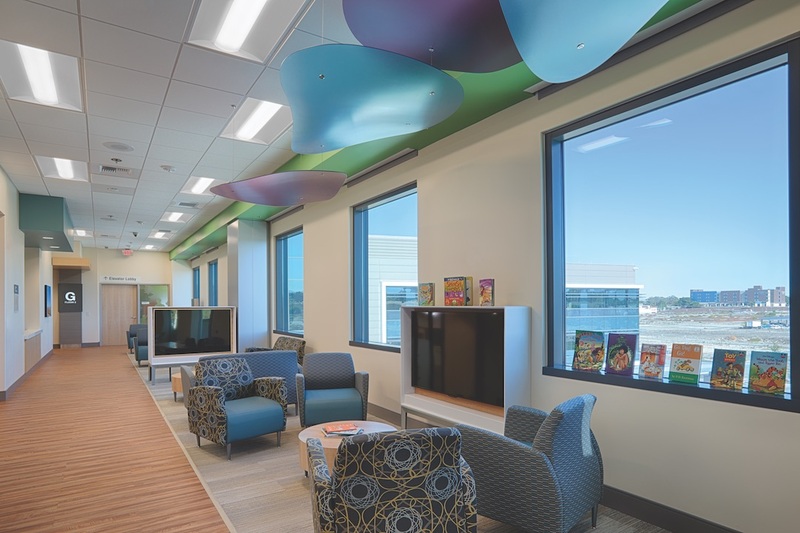 Last year, Apogee finished its design for a 15,000-sf behavioral health center in Columbia, S.C., and so far this year it has completed the design for an administrative space in Orlando, Fla., the expansion of a mental-health facility for the Fresno, Calif., VA, and a new emergency department for the Houston VA.
Beezley says that, over the last year, Apogee has seen a “substantial increase” in the renovations of operating rooms and hybrid ORs, sterile processing services, pharmacies, and elevator projects. “We’re also seeing an uptick in campus master plans with serious thought to what their needs will be, over the next 10 to 20 years” he says. Beezley adds that the VA is giving veterans in rural areas better access to healthcare through its expansion of CBOCs. Heapy Engineering performs engineering services for about $80 million to $100 million in VA projects annually, says Matt Graham, PE, LEED AP BD+C, a Principal with the firm. Many of those projects are CBOCs. The VA, he says, is also upgrading its IV Prep pharmacies to USP 797 and 800 standards, and modernizing its building and campus infrastructures. Graham and other AEC sources say that one of the more significant changes reshaping the VA’s healthcare system is PACT, or Patient Aligned Care Team. This is the Veterans Health Administration’s design guideline for outpatient facility design. One of the first places where the VA rolled out PACT was the 150,000-sf, $82 million Major General William H. Gourley VA-DOD Outpatient Clinic in Marina, Calif., which opened on the dormant Fort Ord military base in August 2017. The clinic is set up with five “neighborhoods,” each with 11 multipurpose, 125-sf exam rooms—five on one side, six on the other. Between them are 30 cubicles where the clinic’s physicians, nurses, and other medical personnel are stationed for quicker responses to patients’ needs. The waiting areas and hallways leading to the exam rooms reflect a hospitality-like environment. The clinic’s on-stage/off-stage setup is focused “on bringing additional care—for example, pharmacy—to the exam room,” says Michael O’Connor, a Principal and Director of Healthcare for Nichols, Melburg & Rossetto Architects + Engineers (NMR) in Redding, Calif., which was the architect, engineer, and interior designer on the Marina project. Patients in exam rooms can also communicate with off-site doctors and specialists via a secure video network. The VA has developed “repeatable templates” for three different-sized outpatient facilities. But Fiotes acknowledges that some medical centers still feel the need to customize PACT for their own purposes. So the VHA is revising those templates to make them more performance-based, and less prescriptive. Is privatization in the VA’s future? Unlike the DOD, which can fund projects incrementally as changes arise, the VA must wait for each appropriation cycle for new financing, says Clark’s De Lutis. Since 2010, the VA has developed a Strategic Capital Investment Planning process to prioritize its infrastructure needs versus the money it has available to pay for them. ProPublica reported in August on one such “alternative,” the Cohen Veterans Network, funded by hedge fund billionaire Steven Cohen, who has spent $275 million to open 10 free mental health clinics across the country. The article (https://bit.ly/2woW8yU) chronicles Cohen’s efforts to get the government to subsidize his clinics. Another ProPublica exposé detailed how three of Trump’s business friends—including Marvel Entertainment Chairman Isaac Perlmutter—have been setting policy for the VA.
On the day after he was fired from his job as the VA’s Secretary last March, David Shulkin wrote an opinion piece in The New York Times (https://nyti.ms/2pOdCBm), in which he warned that privatizing the VA would be detrimental to America’s 20 million veterans. “The private sector, already struggling to provide adequate access to care in many communities, is ill-prepared to handle the number and complexity of patients that would come from closing or downsizing VA hospitals and clinics, particularly when it involves the mental health needs of people scarred by the horrors of war,” he stated. Be that as it may, the VA isn’t averse to turning to the private sector for help to fund some of its projects. The Ambulatory Care Center in Omaha, Neb., which is scheduled to open in the spring of 2020, is one of five such pilot facilities that are authorized to be built under the CHIP IN for Vets Act’s donation concept. Professionals from AEC firms working on the Omaha facility say its construction management, under Heritage Services, has been relatively frictionless. Leo A Daly is the project’s designer, SE, MEP, and sustainability consultant. Jeff Monzu, the firm’s Vice President and Senior Project Manager, says that he’s been able to make design suggestions that touch on how the facility’s registration process and rooms are set up. Other suggestions have included reducing the number of electrical outlets per room based on probable actual usage, and creating separate clinic pods for entering exam rooms in the women’s health area. Ryan Sawall, PE, CHC, LEED AP, Project Manager with McCarthy Building Companies, the Omaha project’s GC, says that his firm came on board before the schematic design started. “Decisions were made quicker, were more reasonable, and were always for what would be best for the VA and its patients,” he says. Among the recent VA projects that Clark Construction has built is the Stantec-designed Veterans Puget Sound Health Care System’s Mental Health & Research Facility, which opened in Seattle this year. To complete this six-story, 204,000-sf building, designed to achieve LEED Gold certification, Clark needed to demolish 63,000 sf of existing structures on site. The facility has a blast-protected curtain wall and metal panel façade. Photo: Clark Construction. The VAOCFM's Fiotes is quick to point out that the Omaha project is not a pure public-private partnership because the developer and builder, Heritage Services, is donating its services, as well as the building itself. The Omaha project’s budget is considerably under the $136 million that the VA had originally estimated. Fiotes explains that this project isn’t bound by federal acquisition and procurement regulations. Significant savings were also realized in the physical security requirements, such as hardening the building, by setting the facility sufficiently back from major public roadways and parking. Foster + Partners designed the facility. Three ceramic-clad sails transport its exterior. Its newest location is positioned as a prototype for national growth. Guidelines emphasize maintaining human interaction. Skanska USA built the project.